HOW TO PRAY THE ROSARY OF TEARS: THE CHAPLET IS PRAYED WITH REGULAR ROSARY BEADS. INSTEAD OF THE CREED, SAY: Crucified Jesus! We fall at Your feet and offer You the tears of her who with deep compassionate love accompanied You on Your sorrowful Way of the Cross. Grant, O Good Master, that we take to heart the lessons which the tears of Your most holy Mother teach us, so that we may fulfill Your holy will on earth, that we may be worthy to praise and exalt You in Heaven for all eternity. INSTEAD OF THE OUR FATHER, SAY: V. O Jesus, look upon the tears of her who loved You most on earth R. And loves You most ardently in Heaven. 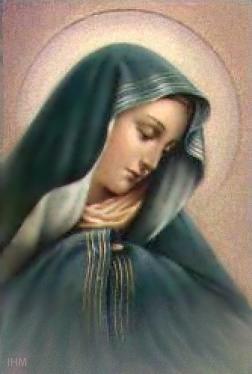 INSTEAD OF THE HAIL MARY, SAY: V. O Jesus, hear our prayers R. For the sake of Your most holy Mother's tears. At the end repeat three times on the small beads the invocations that replace the Our Father. Conclude with this prayer: O Mary, Mother of love, sorrow and mercy, we beg you to unite your prayers with ours so that Jesus, your Divine Son, to Whom we turn may hear our petitions in the name of your maternal tears and may give us in addition to the favors we ask, the crown of everlasting life. Amen.